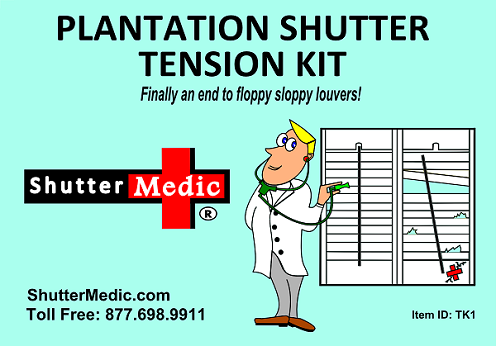 Shutter Tension Kit is an easy do it yourself fix for plantation shutter slats/louvers that annoyingly will not stay in the position you leave them. Watch Video and let us prove it to you. I ordered and promptly received the Shutter Tension Kit. It was "as advertised" and I had purchased it to repair two sets of shutters, each with a broken louver pin. When I originally sat down to Google if anyone sold anything like this (so that I didn't need to shell out hundreds of dollars) I was surprised to find the Shutter Medic kit... but after reading the reviews I thought it was certainly worth a try. Because the kit contained more than what I needed, I was able to modify slightly the installation process. I used two Nylon Louver Tension Pins (internal springs) instead of one Tension Pin and one Louver Pin. That way I didn't need to remove the staple and take the louver completely off the shutter. I'm sure that I'll be purchasing another kit some time in the future as I was surprised to see that the condition of the remaining pins wasn't as good as I'd like. Instructions/video: Superb; Shipping: Superb; Quality of Components: Superb; Kit Completeness (drill bits included! ): Superb; Would I recommend? : YES. THANK YOU SHUTTER MEDIC for saving me hundreds of dollars!! Thank goodness for the internet. I found the Shutter Medic. I decided to tackle the repairs of the plantation shutters(28 sets) in our home. The staples had been pulled out due to dusting the shutters. Your products are great. The how to video is a great inservice tool. We did resort to sharpening the staples with a file and a sander. It made insertion easier. I could not be more pleased with the Shutter Tension Kit, which allowed me to repair my shutters to an almost "brand new" condition. The how-to video was an enormous help. I have performed many "do-it-yourself" home projects over the years, and this one did not require me to make any return trips to Home Depot, which is a first!!!! Extremely easy to install after I viewed the video. Worked like a champ. Excellent solution for its intended use. As an Engineer and DIY person, I highly recommend this and other products they produce.